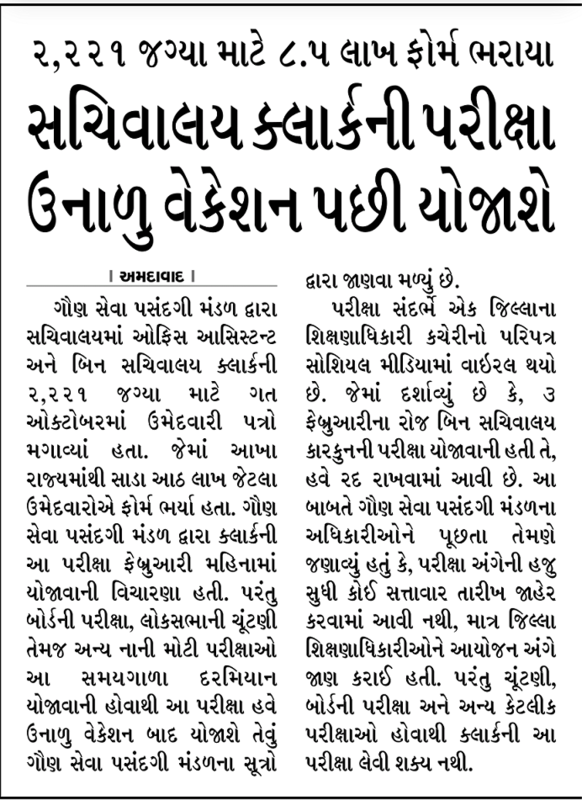 Gujarat Gaun Seva pasandgi Mandal Published Probable Exam Date of Bin Sachivalay Clerk and Office Assistant 2221 Posts. According to GSSSB OMR Exam will be Conducted on 3rd February 2019. Applicant Can Download Bin Sachivalay Exam Call Letter from Ojas Website. We Requested All Applicant to Keep Visiting Website for Bin Sachivalay Exam Call Letter, Syllabus and other IMP Updates. GSSSB Probable Exam Date : 03-02-2019. GSSSB Bin Sachivalay Clerk & Office Assistant Bharti 2018 at gsssb.gujarat.gov.in. Candidate can Apply Online at Ojas portal Ojas.gujarat.gov.in from 12th October 2018. 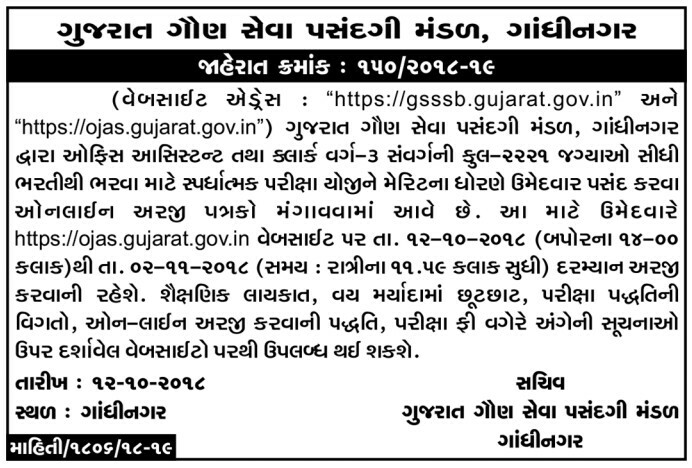 GSSSB aka as Gujarat Gaun Seva Pansandgi Board today Published Advertisement No. 150/2018-19 on various Gujarati News Papers Like Gujarat Samachar, Divyabhaskar, Sandesh etc. to Fill up Total 2221 Jobs of Bin Sachivalay Clerk and Office Assistant Vacancy. Gujarat Subordinate Service Selection Board – GSSSB has issued a recruitment/bharti notification for the post of the Clerk & Office Assistant. There are total 2221 Vacancies. All the information related to the GSSSB Bin Sachivalaya Clerk Bharti/Recruitment 2018 is available here. Lots of Candidate awaiting for this Maru Gujarat Bin Sachivalay Clerk Bharti on Google. Here we inform you that if You are Landing this page for “GSSSB Maru Gujarat Bharti 2018” then this is Correct Place to get Notified. Educational Qualification : Candidates should have the H.S.C Passed (12th Pass) from the recognized Institution. Age Limit : Age of the candidates should not be more than 33 years. SC, ST, SEBC, Ex-Serviceman and PH Categories are exempted from the application fee. All other categories have to pay Rs. 100/- as a application fee. For Online Application Candidate needs to visit OJAS Portal Website ojas.gujarat.gov.in. On the homepage Apply Online and Select for GSSSB Bin Sachivalaya Clerk Recruitment 2018 official notification PDF link. Click on submit button and get Confirmation Number. First candidates have to fill the online application form before the last date of the online application. Shortlisting of the candidates will be done according to the application form. Incomplete application form will be rejected. Interested candidates can apply online as per the given schedule. Candidates are advised to check the eligibility criteria at least once before applying. Date of Written Exam	 to be declared soon. Part-2 Syllabus: Part-2 Exam will be Computer Efficiency Test. I have done MSW. I got two years experience. I am specially interested in HR field. Sir, i have completed diploma in mechanical.may i apply this vacancies. I’m 12th passed and I’m B.com. student. Can I apply? Yes you can apply because you have passed 12th std. I HAVE DONE M.COM, I got two years experience. I am specially interested in ACCOUNTANT field. I am aducated with ba ma bed degree. Gsssb ni last date 2-11-2018 chhe.. Bt try karta form j open nathi thatu.. Ullu banave 6.. It’s not true.. Which book is usefull to over all computer content in binsachivalay exam? Syllabus 150 marks no j bataviyo 6 to 50 marks kya? It’s mistake of them. No change jb subject but 2 subject have not 25 marks but 50 marks of each.4th & 6th column have 50 marks. If now i want to apply for this post.is this possible? How? lalwani dhiraj ramesh bhai . i am hsc pass 50. sir my job.